Calendula infused oil is easy to make! Calendula officinalis, more commonly known as the common Garden Marigold, has been used for centuries to soothe skin irritations and heal wounds. It has tremendous healing properties, yet is gentle enough for babies or animals. In fact, is was the carrier oil used in my son’s first massage an hour after his birth! An infusion is a product that’s made by soaking organic plant material in oil or water to extract it’s soluble constituents. After several weeks, you remove the plant material, and what you have left is the infused product. When you infuse Calendula in oil, you have a product that is anti-inflammatory, antimicrobial, astringent, antifungal, antiviral, and immunostimulant. It can be used to disinfect and treat minor wounds, conjunctivitis, cuts, bruises and burns, athlete’s foot, diaper rashes, and other skin irritations. It stimulates the production of collagen at wound sites which helps to minimize scarring. This gentle, soothing, medicinal oil is perfect for any application that requires oil. It can be used alone or incorporated into massage blends, face serums, wound healing formulas, lip balms, healing salves and everyday body butters. It can be rubbed into an infant’s scalp to help reduce cradle cap and used on the other end for diaper rash. It would be a wonderful addition in blends designed to heal bruises or sore, inflamed muscles. This product will take about 30 minutes to prepare and 4-6 weeks to just sit and infuse. 1. 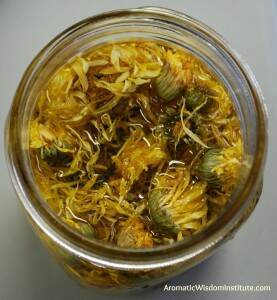 Place Calendula flowers in a clean, dry glass jar. If you are using fresh flowers, let them wilt for about 12 hours to remove the moisture. You definitely want them dry as moisture can make the oil become rancid. 2. Pour your oil into the jar, making sure to cover the flowers by one inch of oil so they have room to expand. Stir well. 3. Cap the jar tightly, add a label with the date and contents. Keep in a sunny spot and turn it upside down or shake once a day. 4. After 4-6 weeks, strain the herbs. Some people, prefer to leave the botanical material in and add new oil, but I prefer to start over. 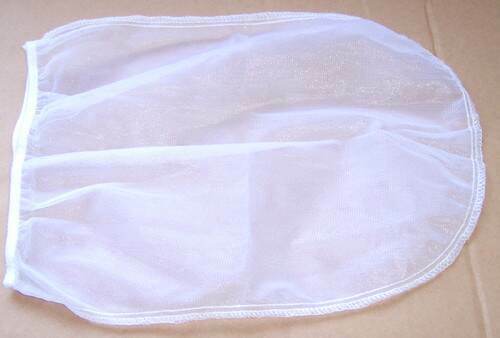 Many people use cheesecloth for straining, but we had great success using a 1 gallon mesh paint strainer which you can find at any hardware store. 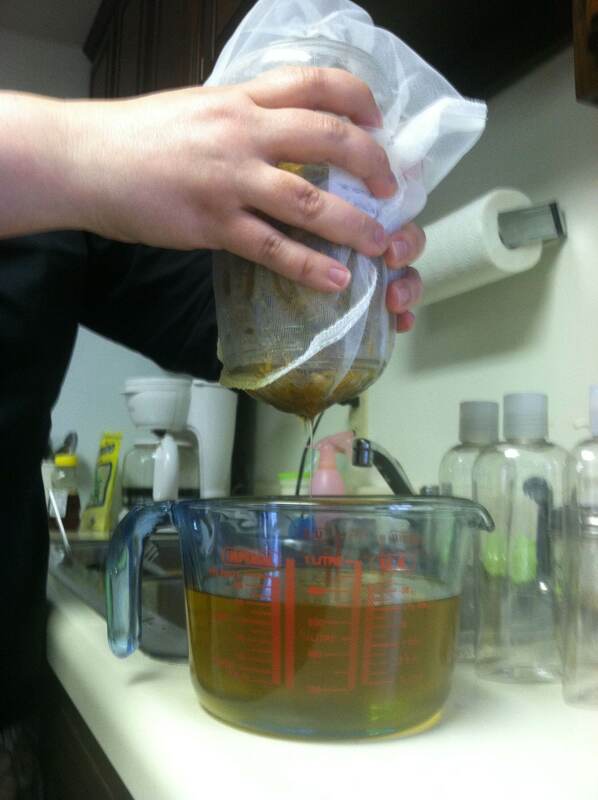 In this picture, Stephanie is straining the oil into a pourable container. Really squeeze to get it all out. 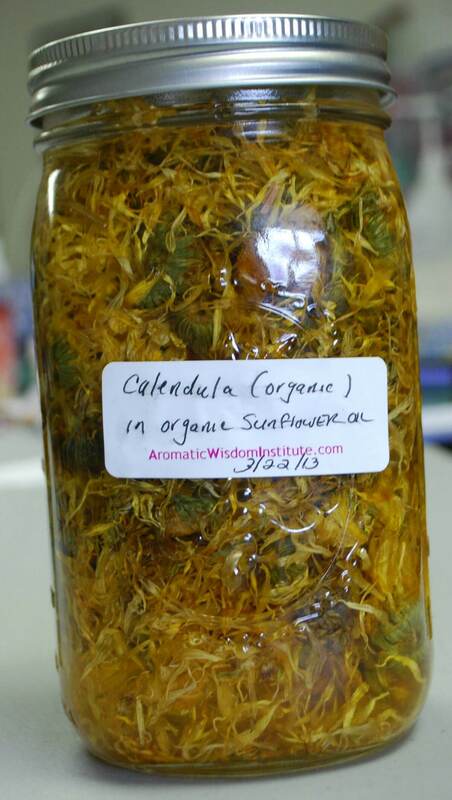 Have you ever used Calendula infused oil? How did you use it? What were the results? Do you enjoy learning about aromatherapy? 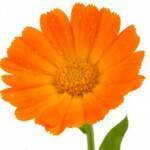 I use calendula infused oil all the time in a healing salve and in a baby soap. In fact, I have more infusing now as a type this. I also like it used straight on my body as an after bath moisturizer. Irene, those are two of the best ways I can think of for using this infused oil. Thanks for sharing! Great post! 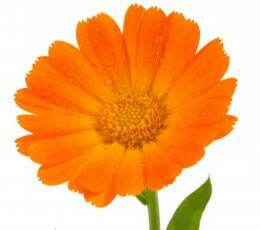 I use a calendula infused oil in most of my whipped body cream formulations especially the eczema cream. I also combine with chamomile to add extra soothing for dry and/or irritated skin. It’s an awesome combination and works well for all skin types. Thank you again for sharing your methods. I am thrilled you’ve highlight a tool other than cheesecloth and I will search for the mesh strainer today! Ayana, I’m so pleased that you liked the mesh strainer reference. Many people use cheesecloth but it can be awkard, messy and leave threads behind. I bought this nylon strainer at Lowes – 2 for just a couple of dollars. Re-usable and SO easy! I’ll bet your whipped body creams are AWESOME! Great tutorial! Very simple and easy to understand. I made my first batch of calendula infused oil recently, and I love it! Great work! 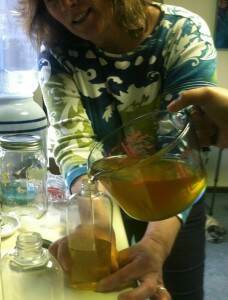 I enjoyed your blog post today, I have made and used Calendula infused oils. I have a question for you about the infused oil, what happens to the medicinal properties of the infused oil when I use it to make soap? Thanks, I’ve wondered this about the essential oils and other infused oils I’ve used in soap making. Is there really a benefit? That’s a great question Jan. As far as I know, using Calendula infused oil in soap won’t change the medicinal or therapeutic properties at all. 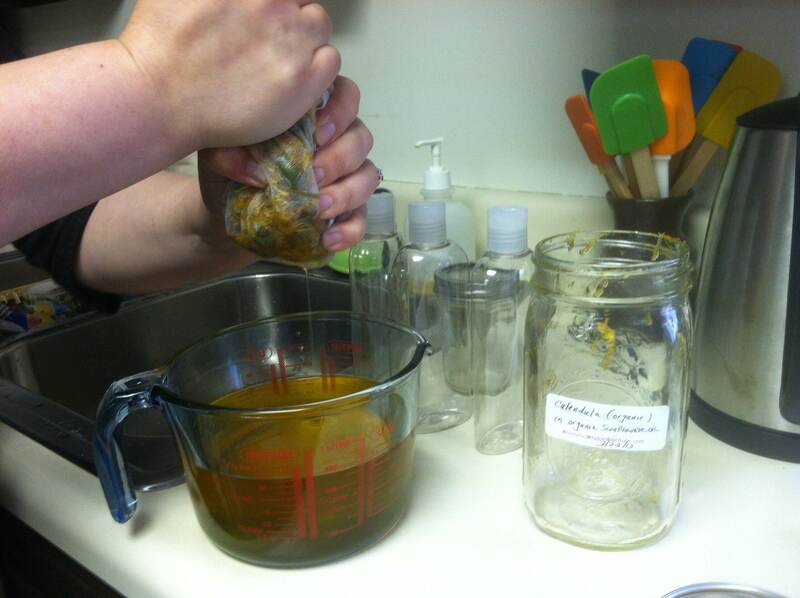 As far as whether or not there is a benefit to using essential oils and infused oils in soap making, I would say absolutely. However, much depends on the quality of essential oils, the amount per bar of essential oil and if heat is being used in the soap making process. Heat pretty much destroys much of the therapeutic value of essential oils. Thank you for posting this! I use calendula for lots of things but have never made my own. What kind of oil do you use? Can I add lavender to it, or would that change the healing properties? Hi Kathleen! The oil that we suggest in the blog post is either organic olive oil or organic sunflower oil. There are links to online places where you can purchase it. Adding lavender to your Calendula oil would be wonderful! 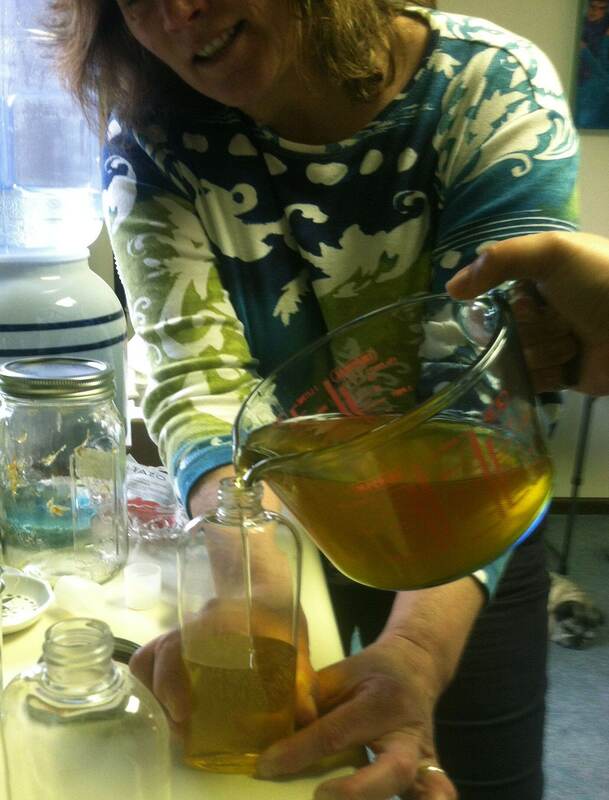 So awesome to see how many people infuse their own oil! You can double or triple infuse, too. 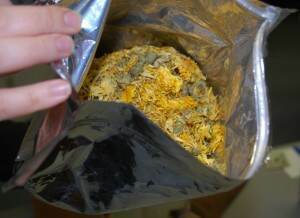 For instance, if you wanted to make your own trauma oil, you could take the calendula infusion and infuse with St. John’s Wort and then arnica. Or, try mixing herbs together and infuse at the same time. I’ve done calendula, chamomile and lavender all at once for a body oil. The possibilities are endless! Thanks so much for sharing, Liz. Hmm, any idea whether this works with acne? This looks like something fun to do. Great post! Very informative and the instructions are very easy to understand. Thank you for sharing. I’m very new to aromatherapy but we are trying to make our home a Zero waste Home so are loving all the homemade infused oils and therapies. Very admirable making your space a zero waste home! Hopefully you will inspire others to do the same. This is great… thanks for sharing. Wow! So greatful to have found ur page. I will b up all night. ? About infusions. U have 5 currently goung and everything I have read so far said to strain my dried herbs weekly and replace them. I have been, im new 🙂 seems wasteful. Was wondering about ur thoughts on this? Hi Jade, I have heard that it’s best to leave your herbs in there for at least 3 months or longer. I agree, replacing them seems wasteful and unnecessary. Thank you for your visit! I’ve been suffering with eczema for years and just today I came across this herb and read up about it. It’s amazing to know that a plant that is readily available where I’m living can relieve me from the pain of my eczema wounds. I have a question, please. 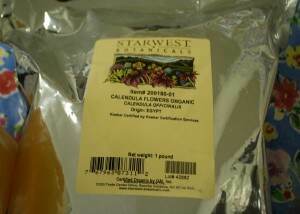 How long can I keep this Calendula Infusion? And what storage conditions would be ideal? Hello, your post was quite timely for me…I have been interested in incorporating calendula into some salves that I would like to create. 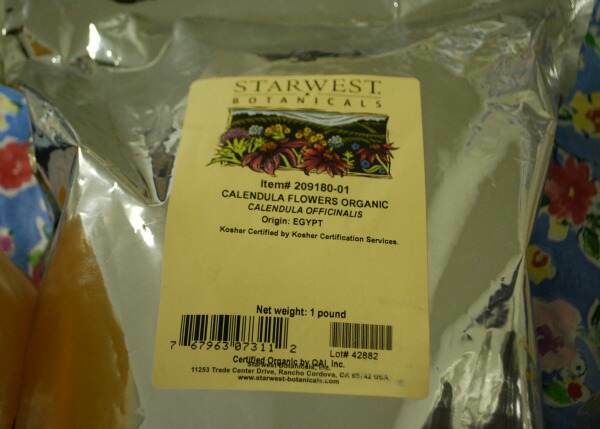 I have been hesitant to infuse calendula in oil because I feel like somewhere along the line I had heard that in order to extract the resinous medicinal properties of the flower it was advisable to tincture instead. Do you have thoughts on that? Hi Monica, great question and I’m so glad you’re finding value here! In truth, I’m not very familiar with the therapeutic value of tinctures. It does seem to me that because their applications are so different, they are both valuable to have on hand. 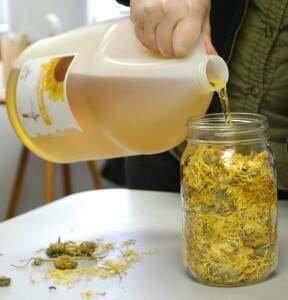 If you have enough plant material, why not try your own “case study” and make both a tincture and an infusion and use them both to see the results. And let me know, too! I made Calendula oil for the first time last Fall and then made some salve with a few drops of Lavender Essential Oil-it’s the best!! We use for cuts, scrapes, burns, diaper rash…I even apply to chapped lips and there’s no issue. BEST stuff I’ve made in a long time! I will definitely be grabbing more flowers from the garden this year! Briliant! It’s a superb base for salves, Lisa. Thanks for sharing that great info! Thanks Liz for the great tutorial with pictures. Is there any way to know the strength of the infused oil or how to make it at a known strength? How long can you infuse the flowers, leave it soaked in the jar with the oil…. 1 year? I hav one jar now its over a year…..got lazy so its still in the jar.. extra virgin olive oil — is this bad? should I dump it? Hi Bry, I can’t say if the infused oil is still good. You will need to open it and see if it smells rancid. It’s probably fine. I wouldn’t keep the plant material in the jar any longer though. 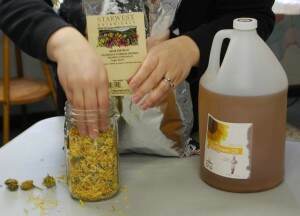 Get some cheesecloth and strain out the plant material as soon as you can. Can you use the flowers I used After I strained them? Hate to see them to go to waste. Maybe put some in the bath? Homemade soaps? Thanks! Hi Michelle, That’s a great question. Their therapeutic value will be pretty well used up, but they might still be pretty in a soap. Just remember that they will be dripping with oil and wilted when they are drained and squeezed from the infusion.